Forte Petrol Saver has been specifically formulated for vehicle owners looking for ways to save fuel and maximise vehicle economy, as a result of the current level of high fuel prices. Forte Petrol Saver is added to the fuel tank to clean and lubricate the entire fuel system, providing optimum fuel efficiency. Specifically formulated in response to consumers' needs to save fuel. Neutralises crankcase Acids. Removes lacquer, varnish, sludge and insoluble deposits from the crankcase. Frees sticking Variable Valve Timing systems, Hydraulic Valve Lifters and Piston Rings. Cleans engines internally and provides anti-wear protection. Cleans oilways ensuring oil flow to critical moving parts. Keeps new oil cleaner for longer. Forte Advanced Formula Motor Flush has been specifically formulated to combat the effects that extended oil drain periods and modern driving habits have on today's technically sophisticated engines. Urban cycle and start/stop driving patterns increase the rate at which acid builds up; leading to accelerated and premature engine wear. Excessive lacquer and varnish formation reduces the efficiency of oil system components, such as VVT systems, piston rings and Hydraulic Valve Lifters. Forte Advanced Formula Motor Flush is fully compatible with all engine components and engine oils which are formulated to meet API and ACEA Service Classifications and international motor manufacturers' specifications. It is essential that engines are flushed with Forte Advanced Formula Motor Flush at each service. Fort Advanced Formula Motor Flush is fully compatible with and will not affect wet clutches. 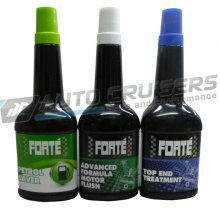 Forte Advanced Formula Motor Flush has been specifically formulated to combat the effects that extended oil drain periods and modern driving habits have on today's technically sophisticated engines. Urban cycle and start/stop driving patterns increase the rate at which acid builds up; leading to accelerated and premature engine wear. Excessive lacquer and varnish formation reduces the efficiency of oil system components, such as VVT systems, piston rings and Hydraulic Valve Lifters. It is essential that engines are flushed with Forte Advanced Formula Motor Flush at each service. Forte Advanced Formula Motor Flush is fully compatible with and will not affect wet clutches. Prevent and eliminate noisy Hydraulic Valve Lifter (HVL) operation. Forte Top End Treatment is compatible with all crankcase fill oils, including fully synthetic, which meet the specification of API and ACEA classifications. It is compatible with High Pressure Direct Injection Petrol and Diesel engines. Forte Top End Treatment maintains efficient operation of VVT and HVT systems. Free off and prevent sticking Variable Valve Timing (VVT) Systems. Free off sticking oil pressure control systems. Forte Top End Treatment is designed to combat contamination, improve and maintain oil system and valve train cleanliness. Technical developments in engine design have made significant improvements in increasing engine power output and lowering emissions. Extended service intervals, however, can contribute to excessive contamination build-up compromising valve train operation. Forte Top End Treatment is compatible with all crankcase fill oils, including fully synthetic, which meet the specification of API and ACEA classifications. It is compatible with High Pressure Direct Injection Petrol and Diesel engines. Forte Top End Treatment maintains efficient operation of VVT and HVT systems. For best results, forte recommends using in conjunction with Forte's Advanced Formula Motor Oil Flush. 14" White Multispoke Car Wheel Trims Hub Caps Covers & Free !! !